PARIS, April 16, 2019 /PRNewswire/ -- thierry Ehrmann, founder/CEO of Artprice: "Too often we only appreciate the true value and importance of something when it has been lost or risks being lost. 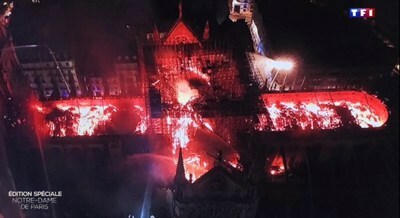 Last night, in the fire that ravaged Notre-Dame de Paris, a treasure of incalculable value for humanity went up in smoke." Judging by the extraordinary international diversity of the visitors who queue up every day, Notre-Dame de Paris is undoubtedly a "jewel of Humanity". With 12 million visitors a year, Notre-Dame de Paris was the most visited monument in the world, ahead of the Great Wall of China or the Great Pyramids (the last of the seven wonders of the ancient world still standing). Indeed, behind its pious façade, crowned with its sumptuous rose window, Notre-Dame de Paris is one of France's most important symbols, but is also a symbol of global cultural significance. Today, the entire planet mourns the destruction of the most famous example of Gothic Art and a veritable masterpiece of "operative masonry".